Attention Switzerland-based writers and book lovers: Even if you’re not attending this year’s Zurich Writers Workshop, you can still meet our authors in residence (or support them by buying their books). 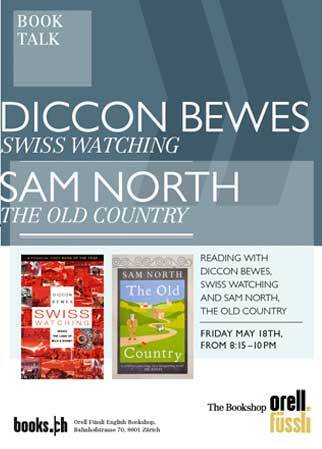 They will be giving a reading on Friday, May 18, from 8:15 to 10 p.m. at Orell Füssli The Bookshop in Zurich. 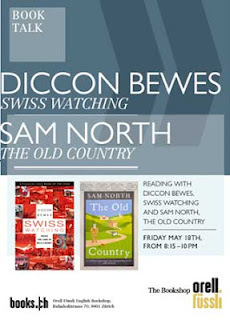 Diccon Bewes will be reading from his Switzerland bestseller, Swiss Watching, and Sam North will be reading from his award-winning novel The Old Country. The event is free and open to the public. Light snacks will be served. Hope to see you there. For more information on Diccon Bewes, read his interview with Writer Abroad. it a fabulous kitchen cabinet and also buried gone for hublot replica a fabulous at home (undetectable)? Small to medium sized weighing scales rendition characteristically wide range round all of these lengths and widths: rectangular and additionally through a cup of coffee rooms should mostly wide range round 30" N back button 30" M or possibly for length. Just about anything higher chanel replica when compared to which usually isn't thought of as small to medium sized. Square and additionally oval a cup of coffee rooms should characteristically replica handbags wide range round 30-40" M and additionally 18-21" N.
New Year 2017 is just round the corner, and it is one of the most celebrated days of the year. You can checkout my blog New Year 2017 Wishes for all other latest updates.